Here’s a quick look at how Dai’s project turned out – certainly a bit different in terms of subject and beautifully finished! The appearance of British tanks on the battlefields of the Western Front in 1916 came as a major shock to the German Army. In response they ordered the production of their own armoured vehicle in 1917. The chassis of the American Holt Tractor was adapted as the basis for both an armoured tank (the A7V) and un-armoured cargo carriers. The A7V, named after the parent organisation the Allgemeines Kriegsdepartement, Abteilung 7 (Verkehrswesen), appeared in 1918. It was originally intended to carry two cannons, but this was later reduced to one 57mm gun plus six machine guns. Unfortunately for the Germans the A7V was not a great success. Despite having 30mm of steel protecting the front of the vehicle and 20mm on the sides, this steel was not hardened armour plate. This may have been able to withstand machine gun and small arms fire, but it could not protect the unfortunate occupants of the vehicle against heavier weapons. The vehicle had a large overhang at the front. This, along with a low ground clearance, hindered its cross-country performance. The driver was perched on the top of the tank, high above the ground, where the hull greatly obscured his vision with large blind spots directly to the front and rear of the vehicle. 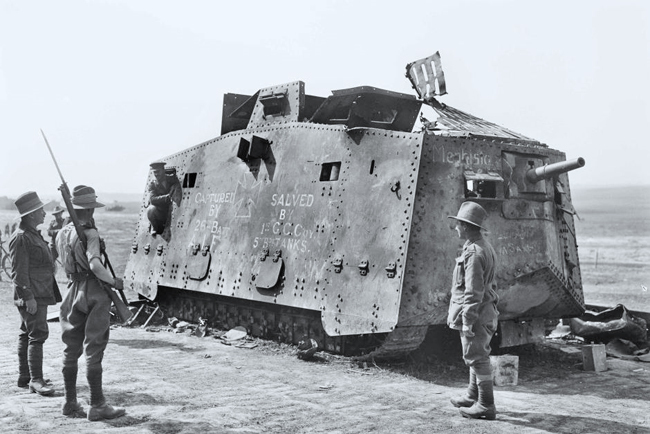 The A7V had a high centre of gravity which made it prone to overturning. The results of one of these vehicles overturning fully loaded with ammunition and fuel, crammed with a full complement of around 16 crew members plus accompanying soldiers, must have been horrific. The A7V was the only German tank design to be used operationally in the war. Only small numbers of A7Vs (around 20) were available, so the contribution that they made was limited. In fact, during the First World War, the German Army made more use of captured tanks than of their own. Until the recent appearance of the Meng A7V, the only option available to modellers wishing to build this odd-looking vehicle in 1:35 scale was the old Tauro kit dating back to 1980. The kit is made up of over 480 plastic parts in tan coloured plastic. There are also two small sprues of weapons. The plastic parts are very well done with sharp detail. There were quite a few ejector pin marks which had to be dealt with. Most of these were raised and could be simply scraped and sanded away, but some were recessed needing a little filler. Strangely for a new, modern kit, there was a little flash on some of the parts, but that was easily cleaned up with a new scalpel blade. There are 108 separate two-part track links in black plastic. The kit also contains a small etched fret, two soft plastic caps and a length of nylon string to make the tow cables. A set of transfers is included for one vehicle – nicknamed ‘Schnuck’. The markings are made up of large black iron crosses with white borders and two odd open crosses that look as if they are meant to represent previously overpainted markings overlaid with tactical numbers. Among the small number of A7V tanks built here were several variations on the basic design, with different configurations of armament and armour. I do not think that any of these other vehicles can be made from this kit without varying degrees of modification. Colour references are for Vallejo paints only. Those preferring paints from other manufacturers will have to translate the colours as appropriate.